So, why now? It’s because I was home alone yesterday. Not reporting to work, as I am on hospitalisation leave for the rest of the year 2010 (Hey.. Don’t gasp.. It isn’t that long, k? It’s just another week to end this year, alright? :D). I am resting at home to recover from a surgery treatment. Well recovering, and am able to do some simple cooking after a-week rest now. 1) Heat a large pot with olive oil over medium fire. Sauté garlic and onion till fragrant and softened. 2) Add the bowl of chopped vegetables and beans, as listed. Stir fry the ingredients for 1 minute. 3) Pour in chicken stock. Add in tomato puree and chopped tomato together with the juice in can. Stir to combine well. Cover pot with lid and bring it to a boil, for about 5 minutes. 4) Add in short pasta and let it cook for 30 minutes. Add in parsley, Italian herbs, white pepper, black pepper and salt, stir to combine and continue to simmer for 10 minutes on low heat. Heat off. Serve hot with crusty bread of your choice of flavours and shapes. I served myself with my favourite Minestrone soup accompanied with toasty sliced bread. A simple plain toast is all you need to complete this hearty soup meal. Simply toast the bread on 170°C for 3 minutes. Well, unless your crusty bread is rocky hard one, don’t steep your plain toast in the soup for too long to avoid over-soften texture. Enjoy the aroma of the soup in your palate, at the same time, the crispiness of the toast which elevates your eating pleasure, just like enjoying the same experience of eating fried bun with Chilli Crab sauce. Yum yum.. Since this is a vegetables soup, it’s pretty low in fat. A large bowl of my Minestrone soup counts about 180kcal (exclude plain toast of 70kcal). For more options: Use of canned tomatoes instead of fresh ones was because the canned tomatoes together with the juice in can added into this cooking yields much richer flavour of the soup, but the choice is yours. As for the tomato puree, I preferred puree than Ketchup as it tastes better, to me. Increase the amount of tomato puree (or Ketchup, if this is opted for), if you are using fresh tomatoes and not the canned ones. The choice of vegetables is varied, too. You may add or substitute the listed recipes with cabbage, pea, baked beans, or zucchini. Besides, the choice of short pasta can also be: elbow macaroni, spiral macaroni, alphabet pasta or broken spaghetti. 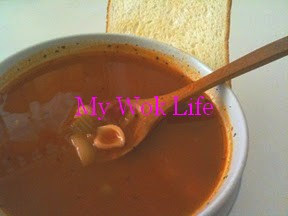 To prepare a REALLLY quick Minestrone soup at home, anytime, you may wish to prepare this tomato sauce base beforehand. Portion out and freeze to store it for many weeks or up to months. Take out only the required amount to simply cook this Minestrone soup by adding the vegetables, broth and 2-3 tablespoons of my homemade tomato pizza sauce which good for the soup, too. Tips: This is a vegetarian soup. If you prefer to have some meaty flavour in this soup, substitute vegetable stock with chicken stock. Add more stock/ broth or reduce addition of tomato puree, if you prefer clearer (more subtle flavour) soup. 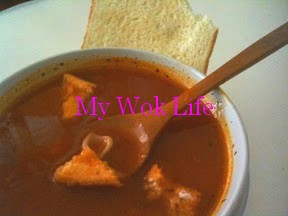 * Use Italian herbs in this recipe help to liven up the overall flavour in the soup. Alternatively, use a mixture of oregano, brasil and thyme, or either of these herbs.